People like to talk to each other and apparently to their devices as well. For instance, comScore finds 40% of adults now use voice search at least 1x per day. Meanwhile, MindMeld research finds 60% of those surveyed say they started using virtual assistants in the past 12 months. Maybe that is why comScore projects 50% of all searches will be done by voice in the next 3Ys and Mediapost projects 30% will be done without using a screen of any sort over the same period of time. It is time for community bankers to talk about this shift in strategic meetings to meet shifting customer behaviors head-on. Over the past year or so, we've been watching closely as the voice-activated technology trend in mobile banking has unfolded. To this point, we've viewed such technology with a healthy dose of skepticism too. After all, there are numerous privacy, security and technology-specific concerns that can arise with voice-activated banking via mobile phone and it was unclear exactly how receptive customers would be to using these systems for financial transactions. It seems customers are much more willing to use their voices to bank on the go than we initially thought. 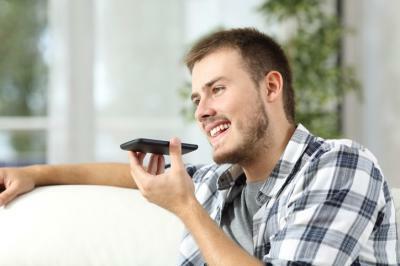 Consider a recent report from Mercator Advisory Group that found 30% of US adults would feel comfortable using a voice-activated conversational interface provided by their bank or credit union to pay a bill or make other banking transactions. Also, Javelin Strategy & Research found more than 50% of all mobile bank users polled express interest in using voice commands. Certainly, there are many banks jumping on the bandwagon and either launching new technology or expanding it from initial rollouts. Just recently, for instance, Royal Bank of Canada launched money transfer for personal banking clients using the Siri personal voice assistant from Apple. Meanwhile, solutions provider D3 Banking recently launched a new intelligent voice banking service using Alexa, Amazon's virtual personal assistant. Santander Bank also upgraded its voice functionality features, allowing its customers to use their voices to make payments, execute money transfers, check their account balances, report lost or stolen cards and inquire about spending patterns and specific transactions. Finally, Wells Fargo is reportedly close to rolling out a voice-driven payments system to allow customers to transfer funds via voice commands. To be sure, the accuracy of voice-activated systems has been a challenge thus far. The systems don't always catch everything accurately and have known to be fallible - particularly for people who have speech impediments or heavy accents. However, recent reports are showing vast improvements in the technology's ability to capture voices correctly. Published comments from Mary Meeker--the prominent ex-Morgan Stanley research analyst turned venture capitalist--indicate that voice recognition accuracy has surpassed 90% and is nearing the 99% mark. Given that more customers seem to be interested in voice-activated mobile banking and that more institutions are adopting it, we think it's time community banks give it a fresh look. Certainly, there are many considerations, but looking cannot hurt. You will also have to think about whether to allow customers to perform only routine tasks like checking account balances via voice, or whether customers should have more advanced capabilities like transferring funds. We don't have all the answers, but we do believe banks need to amplify these conversations. Yields flew up 6bp as investors continued to breathe a sigh of relief with the French centrist candidate in the lead. Credit Suisse research projects more than 8,600 brick & mortar retail stores will close this year vs. 2,056 last year and 5,077 in 2015. If this level is reached, it would exceed the prior record hit in 2008 by almost 40%. Through April 6, closings have already been announced for 2,880 retail locations. S&P Global Market Intelligence research indicates the following US companies have the highest 1Y probability of default: retailer Sears Holdings (23.8%), precious metal and jewelry wholesaler and retailer DGSE Companies (14.9%), appliance recycling and services company Appliance Recycling Centers of America (12.0%), retailer The Bon-Ton Stores (10.5%), retailer Bebe Stores (10.1%) and men's big and tall apparel retailer Destination XL Group (8.1%). 1) Bank of the Sierra ($2.0B, CA) will acquire Ojai Community Bank ($257mm, CA) for about $35.7mm in stock (100%). 2) National Bank of Commerce ($2.0B, AL) will acquire Patriot Bank ($155mm, FL) for cash and stock. Research that looked at 6mm username and password combinations found 91% of users had used one of the 1,000 most common. Research by Deloitte finds 90% of CEOs believe their company is facing disruptive change driven by digital technologies and a whopping 70% say their company does not have the skills to adapt. A Clutch survey of small business owners finds the following activities related to search engine optimization (SEO): local search optimization (52%), on site optimization (52%), create high quality content to earn links (48%), and guest blog on other websites (48%). A survey of small business owners by instantprint finds 48% agree their company reputation is their most valuable asset vs. 11% who said their product was the most important.